We’ve noticed increasing numbers of clients are requesting us to include an overmantel in the design of their kitchens. The strong framing that a faux chimneybreast with an overmantel gives to the wall above the cooker and the useful high storage shelf have made them a popular feature. They are perfect for country or traditional style kitchens. Kitchen overmantels, like their living room cousin the mantelpiece, started out in Mediaeval times as a hood projecting over an open fire to direct smoke up the chimney. The shelf above the hood was convenient for storage. As cooking technology evolved and coal and gas fired ranges and eventually electric ovens entered the everyday kitchen, overmantels ceased to serve a purpose and they began to disappear from kitchens. The modern overmantel is a mock-up of a traditional looking fireplace at one end of your kitchen, but when you are having something built bespoke, it doesn’t have to be purely decorative. Our design includes base cabinets in the sides of the faux fireplace and these can be expanded for extra storage if required. There are various lighting options for the underside of the mantel and we can even include an extractor fan – bringing the overmantel back to its original purpose! You don’t have to have a chimney breast in your kitchen in order to install a modern overmantel. We have installed plenty of overmantels on walls that historically had no chimney. We install the base cabinets and then affix the overmantel above them. For higher ceilings, we can create a diminishing chimney style. We can adjust the style of your mantel to suit the mouldings and cornices of your chosen kitchen design – it depends how intricate you want the detailing to be. When you choose to have a kitchen built and installed by Bear and Woods, you can have a say in every single feature of the design. 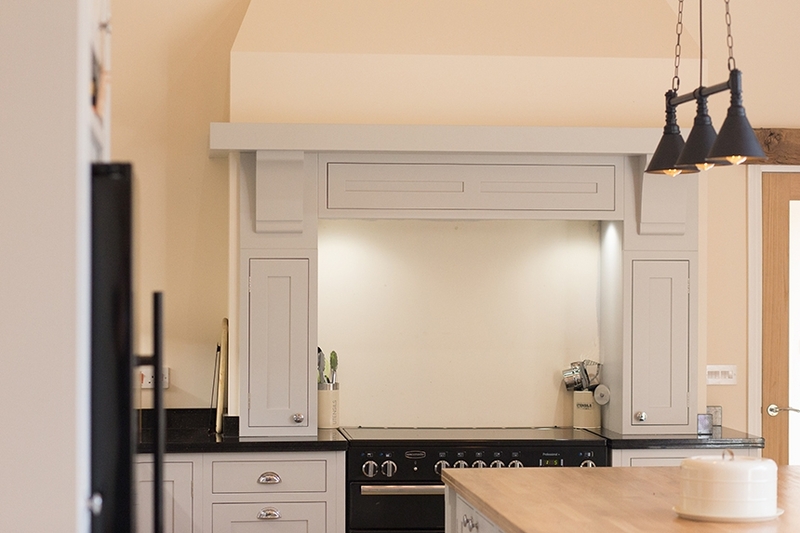 To request a kitchen design consultation, fill out the online form or call us on 01603 905145. Follow us on Facebook for regular kitchen design inspiration.